I want to share a recording technique that I read about when I started studio work and have used during sessions over the last several years. 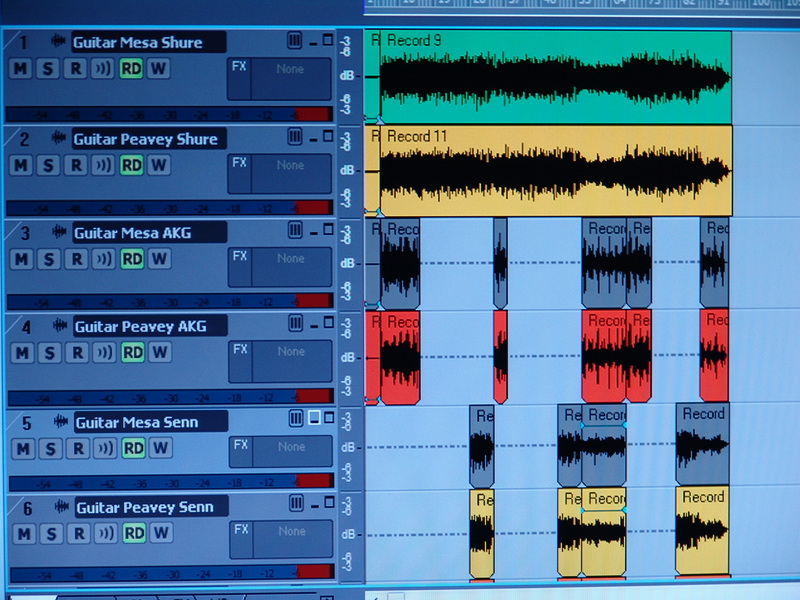 The idea is to track one guitar performance and end up with multiple tracks with different sound qualities. To do this we have the guitar running in to two separate amplifiers – to get the best variety use amps with different sound qualities. 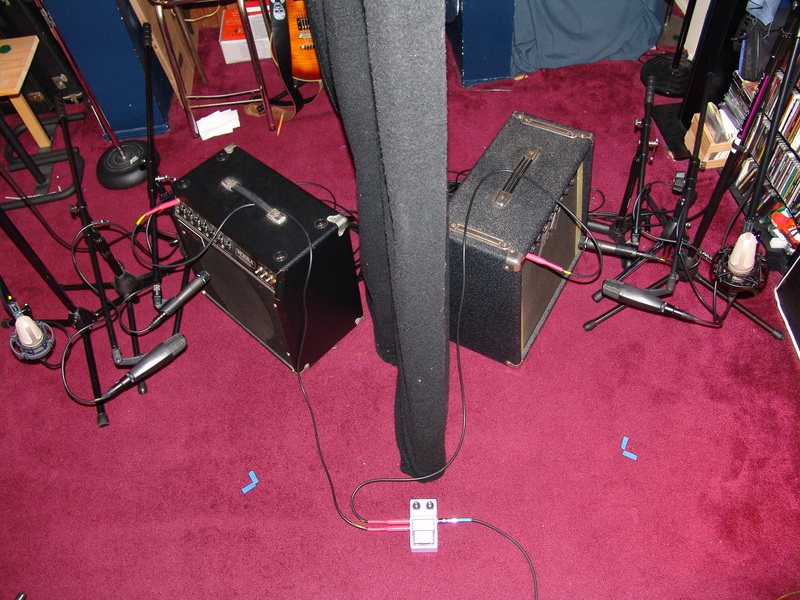 For the example in the photo we’re using a Peavey amp on one side and a Mesa on the other side. Make sure the amps are separated so there is no bleed over between them. Each amp’s sound will be captured by three microphones. In our example we are using two dynamic mics close to the amp and one condenser mic slightly farther away on each side. 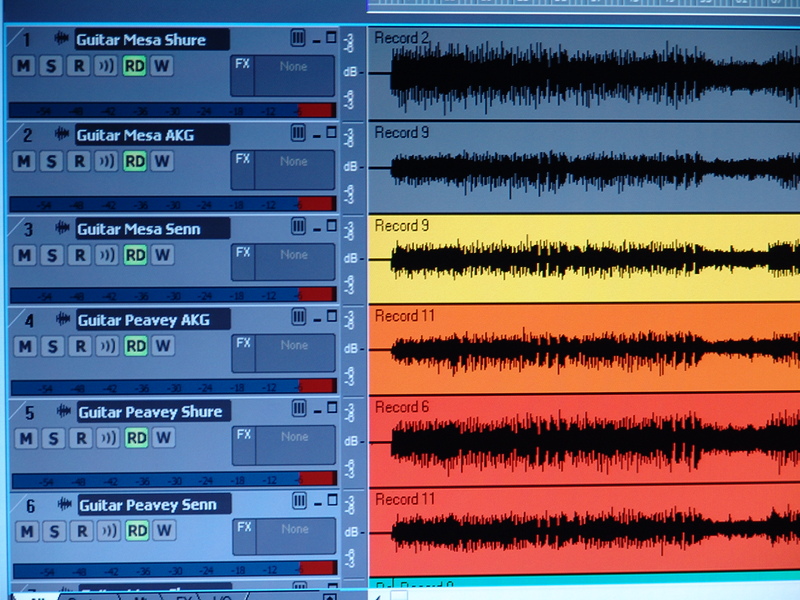 Each mic will go to a separate track in the recording software as seen in the photo below. You now have six unique guitar sounds you can use throughout the song. In our example we split the guitar signal going to the amps with a stereo chorus effect to allow for a greater stereo field when panning tracks left and right. In the final photo below you can see how we used the diverse sounds throughout the song, bringing in different mics during verses, choruses and breaks. You can now accent different parts of the song with unique sonic signatures while maintaining a consistent guitar performance. If you have enough tracks on your mixing console you can enhance these changes further using different settings of EQ, dynamics and effects on each track. This simple set up will provide you with multiple guitar sounds to make your track sonically interesting.